Since then, slow and regular has proceeded a calendar of subtraction—one pebble taken out for every day lived since. And today I remove the last one: the bucket is empty for the first time since birth. But what a vacuous view of marriage this is, as if its function were erasure. And yet, there is some slight truth even here. Part of the hope of love is the freedom to experience the self anew, to neutralize the weight of the past. Maybe the image is not one of emptying a bucket, for I can’t really erase the past. Maybe I am filling a second bucket. The two buckets are on either side of a teeter-totter. Since my wedding day, the past has won out, inertly pinned to the ground, yet so also was lifted the marriage bucket of renewal and liberty. So many years have passed with no movement that I had forgotten the teeter could totter at all. But today, with the 9987th pebble, the rusty playground hinge makes a groan. The marriage and the past come into equilibrium, and the two strike a balance. Neither one is on the ground now; but neither is in the sky either. In 13 days I will have been married 10,000 days; that seems like a number worth celebrating. 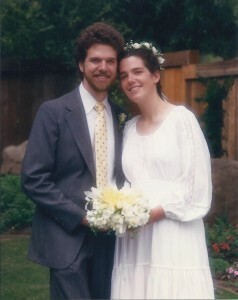 And this past May, my wife and I toasted 27 (33) years of marriage; a great milestone. But today, this personal equinox is at hand. I imagine a ceremony, a giving away of the groom by both my parents. The finitude of their experience with me has finally been measured, met and surpassed. Today I am more my wife’s than theirs; I have lived into a present identity, and outlived a past one. She has met their ante, and bet beyond. Maybe a deed is signed; maybe a pink slip changes hands. My wife alone can tell how expensive the purchase has been. This must seem geeky, this number thing. Please don’t think I am any sort of Rainman. No, I can’t tell you what day of the week Christmas 1957 fell on. I simply used an online date calculator to do the math. But perhaps only a geek would think to use such a thing. How many marriages drift through the doubling of a wedding age without a murmur? A lot. Almost all. In fact, can you even name one other person who has counted up such a thing? Yep, pretty geeky. But it started out, years ago, with an innocent enough question. “Has my wife (who is younger) spent more than half her life with me?” I wanted to know. And once I knew that she had, it opened up a strange asymmetry in our relationship. She had spent more than half her life with me; but I had spent less than half mine with her. It seemed unfair, as if I were holding back. Kim was all-in; and I was still weighted towards my single years. Of course, a calendar has nothing to do with commitment; it’s just a silly numbers game. It probably doesn’t mean anything. But still, to me it does. Like passing an asteroid belt in a long journey through the solar system. A life threshold, like losing a parent, that reminds you of the irreversibility of time. I am reminded today that the past is finite, a closed book; but the present lives and stretches forwards. It reminds me that daily pebbles add up, unnoticed, and all at once the scale tips. In that way, it’s kind of a big deal. The balance lasts only a day. Tomorrow, the 9988th pebble will drop and the marriage bucket will tilt towards the ground. And here’s the thing: the totter will never teeter again. The finite bucket of the past will remain forever lifted and never come down again. I can stand firmly on the ground with my life partner, and the past need never again outweigh the present. Perhaps we’ll knock over the buckets, and play on the teeter-totter. Or maybe we’ll finally empty them, and build sandcastles at the beach. You’re apparently as geeky as our brother Mike, who called yesterday to inquire about Rob turning “7 squared!” LOL. Thanks, Sissy!! I’ll straighten your lamp piece! !! Hey, are we expecting you THIS WEEKEND??? so sweet these words and photos, so lovely to see friends of my youth succeed in this way on the eve of my first wedding, and in my golden year no less. Maybe we’ll make it to double our life and see a golden anniversary. Congratulations! May we also see a recent photo? I’d love to see Kim again. Thanks, Lisa, for reaching out. Really!? Are you on the verge of your first marriage!? Great good wishes to you! And congratulations!! As for a current photo, I’ll dig something up and message you on FB. Don’t feel geeky. I have been tracking (on a wall calendar at home one day a month) how many days old I am since the latter half of last year, when I realized I was closing in on 20,000. Every Friday the number is evenly divisible by 7 since I was born on a Saturday. Big bro, you will always have me beat in this numbers game. I am your humble apprentice! Thank you for your consciousness-shifting sharing. What a sweet thoughtful reply, Bob. Yes, the essay is a bit of quirky hot air, but there is love and wonder underneath. So glad you took the time to read it! Blessings on this day! I remember when both of you were up in the air on your own teeter-totters. Now that you’re both on the ground, run and jump on the merry-go-round! May you spin dizzingly into the night, dear ones, geeky as only you can be. I like dizzingly better! Thanks for the blessing, Nati Nati.